The Mayfair has been carefully designed and manufactured to a standard which we have maintained for over 100 years. 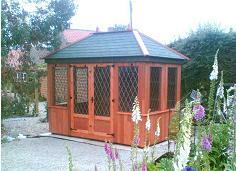 Classically styled to provide a focal point to enhance your garden, and we feel sure you will enjoy many hours of leisure throughout the long life of this traditional summerhouse. Manufactured in Western Red Cedarwood complimented by antique style door fittings and diamond leading glazing, the quality and price give excellent value.